Reasons for choosing to read this title. The blurb intrigued me. The world described seemed fascinating, and I was eager to discover more. The Prophecy, the first book in the Saga of the Chosen, is an Urban Fantasy about, witches, wizards, shifters and vampires. In this new series, readers are introduced to Tasia. She is a special Chosen pretending to be a low-level witch. She has the unique ability to sense blood magic inherent in other Chosens. However, she needed to keep her abilities hidden, as exposure would prove dangerous. She has been doing a good job of keeping her identity hidden until that fateful night when she decided to come to the rescue of an injured shifter. Her altruism placed her in a precarious position resulting in her receiving protection from the Alpha of the local shifter pack. She faced further danger when a powerful wizard manipulated an old prophecy in a quest for power. She would find herself embroiled in a dangerous game of cat and mouse. A game, which has the potential to reveal the secrets, she so desperately tries to hide. Faced with the risks of her secrets being exposed she now has to decide whom she can trust to keep her safe. This is the first book by Petra London I have read and I would read more from this author. With an interesting and unique story line, Ms. London pulled me into the world she created. In this world, supernatural beings are called Chosen and in each species, some are more powerful than the other. They believed themselves superior to humans who were not aware of their existence and rules were in place to ensure it remained this way. The various species which includes witches/wizards, vampires and shifters, do not play well together. However, witches/wizards and shifters will work together albeit reluctantly to help solve a 25-year-old mystery. The story started out with a bang, which made me eager to discover how events would unfold. However, things hit a snag, and the story slowed down with events heating up in the last forty percent. The story, which was narrated from the key players POV, was well written. The detailed and descriptive writing made for an enriching reading experience. I enjoyed spending time with the characters. As with every story there are characters you love, those you love to hate, and The Prophecy was no exception. The key players were quite fascinating, and I eagerly turned the pages so I could learn more about them. The shifters were one of the many intriguing aspects of the story. There were shifters who had different beasts within them. The alpha protector was not only a shifter but also a wizard although he abandoned that part of his heritage. I was curious to know his reason for leaving that part of his life behind. The author gave insight, but it was not enough to satisfy my curiosity. If you are looking for romance, then you would be disappointed. The author focused on development of friendships as well However, based on how the plot was developed romance is brewing on the horizon between some key players. I have my ideas who would likely end up being a couple, but I will have to wait until the next book to discover if I am right in my assumptions. The book was lengthy. This is not usually an issue for me, but in this case it was due to the inclusion of unnecessary scenes. There were several repetitions. The scenes repeated were memories of what transpired earlier on in the book. I found it confusing, and I skipped these scenes. The pacing was not befitting of the genre. It moved slowly for my tastes. There were action scenes but few and when they occurred, it was over within the blink of an eye. For a story, which involves magic, I was expecting to see a few scenes featuring this element, but this was not the case. Overall, this was not a bad book. It has great potential, but there were a few misses, which prevented me from giving it a higher rating. There are a lot of loose ends, but seeing that this is the first book in the series it came as no surprise. I am eager to see how the 25-year-old mystery will unfold and I eagerly await the release of the next book in the series. Fans of urban fantasy would enjoy visiting this magical world. This is a good start to the series. A powerful wizard threatens the Chosen from beyond the grave. Can they unravel The Prophecy in time to save their world! Chosen have walked the earth for time immemorial. Tasia is a very special Chosen. Warned to keep her distance from her brethren, she makes a fateful decision one night to assist an injured Shape-shifter. Suddenly, Tasia finds herself in the cross-hairs of Shifter mercenaries encroaching on San Francisco. Forced out of the shadows, Tasia has little choice but to ally herself with the local Shifter Pack led by a formidable and dangerous Alpha Protector. 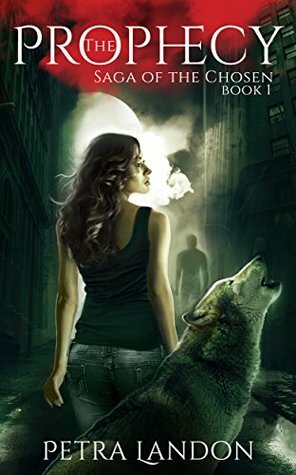 In the cut-throat world of a Shifter Pack, Tasia must fight to protect her secrets while struggling to negotiate with the enigmatic Alpha who holds his violent Pack together with a ruthless hand on its reins. Grave danger threatens their world as a powerful wizard exploits an old prophecy to divide the Chosen. When the Pack is asked to investigate the twenty-five year old mystery, Tasia is drawn deeper into a past that risks raising the suspicions of the very Chosen she hides from. As danger closes in on her, Tasia must decide who to trust with the deadly secrets she guards. Author's Note : The Prophecy is the first book of Saga of the Chosen , an urban fantasy series sprinkled with action, adventure, an unfolding mystery and a dose of romance. Set in contemporary San Francisco in the fantastical and intrigue-ridden world of Chosen where factions of Wizards, Shape-shifters, Vampires and others vie for power and influence over their kind, it introduces Tasia Armstrong, a Magick with dangerous secrets and powers. Circumstances propel Tasia from a nondescript life on the fringes of Chosen society to a crucial role in an investigation to decode a mysterious plot from the past that threatens her people. Along the way, she gains new friends and allies while struggling to maintain a tempestuous alliance with the local Shape-shifter Pack. Thrust into a world where the line between friend and foe is often hard to decipher, Tasia must figure out the rules quickly even as danger stalks ever closer to her.